Back in 2011 the Rebels joined the Super Rugby galaxy, and managed to win just 3 of 16 games in their first year. 2012 was a little better, 4 wins in 16 games played. And again, a little better in 2013, 5 wins in 16 starts. Regression in 2014, just 4 wins in 16 games. 2015 was a brilliant year, in Rebel terms, 7 wins in 16 starts, and third in the Aussie conference. Wow! They maintained that position and result in 2016, another 7 wins in 15 games, and third again! 2017 was not so good. Just 1 win in 15 starts, and stone last in the Super Rugby competition. Even finishing behind the woeful Sunwolves, earning just 9 log points and a negative points balance of -333. Somehow the politicians who run Aussie rugby felt that the Rebels, stone last in the Aussie conference, were a better prospect for the future than the Force, who had finished second on the Aussie log with 26 points and 6 wins in their 15 starts. Somehow the Force were dumped out of Super Rugby and the Rebels survived to fight on. The ARU decision was never explained. The coach, Tony McGahan, and most of the 2017 playing squad were released from their contracts, while Dave Wessels, from the recently dumped Force was quickly appointed to take on the Rebels coaching job. He brought almost half his Force playing squad with him. No less than 26 of the 2017 Rebels were disposed of, and 11 of the ex-Force squad were signed on in Melbourne. Others were recruited from around Australia and the world, includingWill Genia, Adam Coleman, Geoff Parling, Amanaki Mafi, and Lopeti Timani. 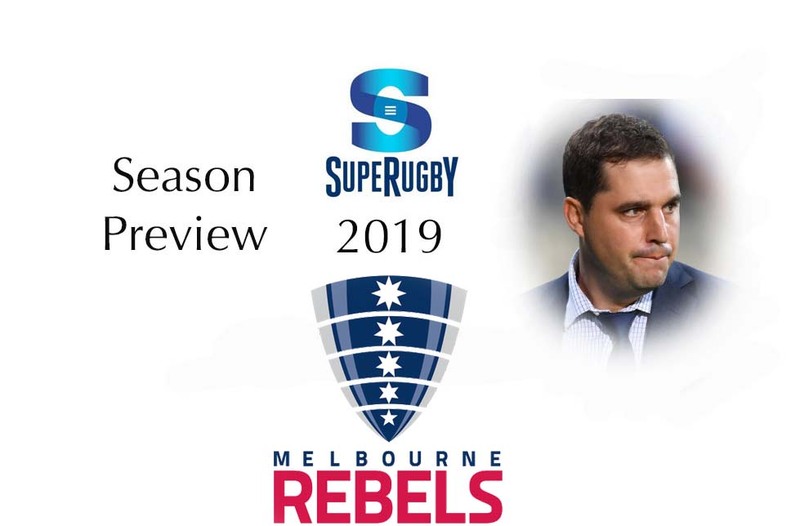 When I did my pre-season preview of the 2018 Rebels I suggested that it was rather difficult to make a prediction of who, what, where, when, how, or how much the Rebels would be in 2017. They were essentially a brand new rugby club, with a brand new team and coaching squad. 2018 would be the measure. Well, sadly, after some promising moments, 2018 proved to be another damp squib for rugby in Melbourne. The Rebels did manage to finish 2ndin the Aussie conference, winning 7 of their 16 starts, banking 36 log points, and scoring 57 tries. Sadly, they leaked 60 tries and ended the season with a negative points difference of -21 despite their lofty position on the Aussie log. On the overall log they ended in 9thposition, which also reflects on how poor the rest of the Super teams really were. Will the Rebels be any better in 2019? They have added a couple of big names to their playing roster, and there is some continuity and stability in the coaching department, but the jury is still out on their prospects. One thing we do know, the Melbournites will still leave most of the seats in their AAMI stadium empty as Rugby Union has failed to catch the attention and interest of the people of that otherwise sports-mad city.. The retirement of Laurie Weeks and Geoff Parling deprives the Rebels of a lot of experience, although both will continue to assist the Rebels off the field, Parling as a newly-appointed lineout coach. In addition to the retirees, the Rebels have lost Jack Debreczeni to the Chiefs while Colby Fainga’a and David Horwitz have gone off to Connacht in Ireland. Lopeti Timani has joined La Rochelle in France, and Amanaki Mafi has gone over to Japan to play for the NTT Shining Arcs. Sefa Naivalu has headed north to go and play his rugby for the Reds. The departure of Amanaki Mafi will probably have the biggest impact as he was undoubtedly one of their best attacking players, albeit with a serious discipline problem. Perhaps the most interesting signing of them all is the arrival of the controversial Quade Cooper, who moves to Melbourne after a year of dog-in-the-manger exile in Brisbane where he simply refused to look for another professional contract whilst playing club rugby in Queensland and banking the considerable monthly salary that the Reds were obliged to pay him. The 30-year old Cooper might be heading towards the end of his somewhat controversial and always mercurial career, but he does bring the experience of 118 Super Rugby caps and the potential to add some sparkle to the Rebel cause. Another worthwhile signing is the return of Matt Toomua from his spell with the Leicester Tigers. Other signings include Mees Erasmus from the Brumbies while Hugh Roach and Brad Wilkin join from the Waratahs. Isi Naisarani, another ex-Brumbie, has been brought in as a replacement for Mafi, while Campbell Magnay has been lured back to Australia from overseas. Much has been made about the arrival of Quade Cooper and his potential as a game breaker. When he is on song, he is always worth watching. Sadly, more often than not, he simply pitches up without the interest, motivation, focus and sparkle he is capable of producing. Perhaps the change in scenery will serve to motivate him? Dave Wessels must also be aware of Cooper’s seriously disruptive influence in the changerooms. Cooper aside, the arrival of Matt Toomua might add some necessary technical and tactical nous to the midfield, combining with Reece Hodge in what looks like very promising midfield, which in turn will allow the likes of Marika Koroibete to play the attacking role nature designed him to play! Scoring just four tries in 13 games in 2018 is nowhere near what is expected of the powerful Fijian! They have the squad, and they have probably the best coach in Australia, so it is time for the Rebels to step up a gear. 2019 will be the year that the Rebels finish at the top of the Aussie conference.